Columbia River fishing guides are some of the most talented outdoor professionals in the world. This is a bold statement but Columbia River fishing poses some unique challenges to fishermen that are rarely found in such prevalence elsewhere. When you make your living guiding on the Columbia’s waters you had better be intimately familiar with the river’s moods, patterns and hazards, or you're going to find that it can be a very unforgiving place. Fishing the Columbia River can provide world class salmon, sturgeon, and steelhead fishing. It can be fast-paced and very productive; it can also be extremely slow with few or no fish being caught. Strong currents, big tides, sand bars, fog, floating debris, and navigational hazards abound, not to mention the second most dangerous bar (ocean entrance) in the world! These are just some of the things that are up against Columbia River fishing guides and fishermen. Great Columbia River fishing guides don't just happen, they are made. These individuals are forged from years of beating themselves against big water, extreme elements and the pursuit of very large fish. These folks didn't just wake up one morning being exceptionally good at handling everything that the Columbia River can throw at them. Like any skilled professional, it takes years of training, hands-on experience, and continuing education to stay at the top of all aspects of their game. Several factors combine to make up the skill set required to be a great Columbia River fishing guide. Let's go into a little bit of detail about some of these skills. Can the guide service get customers, and if so can they retain those customers? A high booking AND repeat ratio equals success for Columbia River fishing guides and their customers. This is very important when deciding whether or not a particular fishing guide is in the top five or 10% of their peers. It all boils down to whether or not the guide is actually out fishing. Any fishing guide can hang out their shingle and get the occasional customer booking, which means they are on the water occasionally. Being on the Columbia River fishing every once in a while doesn't equal the same knowledge, experience and results as being on the water every day, of every season, of every year, for multiple years in a row. Getting customers, having those customers repeat, and having a constantly growing business means that the guide is going to be fishing a lot, and is going to have their fishing game (and your trip) really dialed in. These types of Columbia River fishing guides don't have the learning curve problem that arises from not being on the water every day. Is the guide able to see patterns forming and changing? Are they focused, with attention to detail? There are times on any body of water, including the Columbia River, where the fish are so cooperative that you don't have to be good, you just have to show up! However if you’ve spent much time fishing, you know that days like these are special and certainly don't happen every day. What does being focused, having attention to detail, and being able to see patterns have to do with this? It's simple; guides with these capabilities are going to be the only ones catching fish when the fishing is tough. They are also going to be the ones that catch the most fish, the biggest fish and are limited out first on those days when the fish are really biting! When you’re an extremely good Columbia River fisherman, everything about your program is head and shoulders above average. Your average days are above average compared to other anglers, and your good and great days have people talking about you, with some in disbelief. What it boils down to is this; you want to be with the Columbia River guide that has the fisheries’ patterns and details pieced together. On those tough days when there is only going to be one fish caught, you're going to be in the boat that gets that one fish. On days when the fishing is just average, you’re going to have a very good day, and when the fishing is good for everyone else … you guys are just going to kill them! 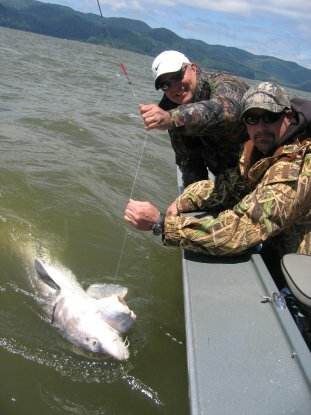 Remember fishing is fishing and fishing isn't always good, and Columbia River fishing is no exception to this pattern. The River is constantly changing and sometimes the fish just aren't there, but a great guide’s knowledge, experience and attitude are always there and can make a tough day good and a good day great! What happens at the end of the day? Your fishing on the Columbia River is over, but the trip isn't, and the work is just beginning. All fishing guides have a different perspective on taking care of the catch at the end of the day. If you've hired a top shelf professional they’re going to make sure that your fish is processed in the manner that you prefer. For most anglers this means having the fish filleted. Others may prefer to have their catch steaked. Either way the angler should be given the choice regarding processing. What we're really saying is, gutting the fish, sticking it in a bag, and sending it home with you isn’t the right way of taking care of your catch at the end of the day (unless of course that’s what you want). You can get this level of service on a 20 person charter boat and that is not why you paid the premium to go with a professional fishing guide. The stretch of water that we refer to as the lower Columbia River, is the 137 miles of water that flows from Bonneville Dam (40 miles east of Portland, Oregon) all the way to the Pacific Ocean near Astoria, Oregon. This stretch of River including the lower Willamette River has catchable numbers of at least one species fish or another, whether it be salmon, sturgeon, steelhead or walleye, there is always something to fish for! Rates - The Guides - Contact Us - Book a Trip - Why Hire Us? Spending your life doing something you love is the secret to happiness. Attention to detail and being absolutely driven, catches fish and creates success. A focused effort catches more fish and bigger fish. Just going through the motions is for other people. Spending extra time and effort toward making your day successful is important and makes a difference. We believe that cutting corners on expenses and effort isn't something you do, even if nobody else will know. We believe we should expect the most from every day on the water and hold ourselves to a higher standard. We should give back as much and as often as we possibly can. It's our job to act as stewards of the resource and as consummate professionals who know that our actions speak louder then words. Giving 100% every day is the norm, because Buoy 10 or Estuary sturgeon or whatever season we happen to be in only comes around once a year, and in a few weeks it will be over. Let's be realistic ... every one of us has to have a last day on the water. We never know when that day will come, so we are absolutely going to make every day our best day. We don't have gimmicks like "Fish Catch Guarantees". We won't tell you that we're catching 50 pound salmon every week, or tell you the fishing is red hot when it's not, or any of the other assorted things that guides tell prospective clients to get them on their boats. We're honest and we have integrity. 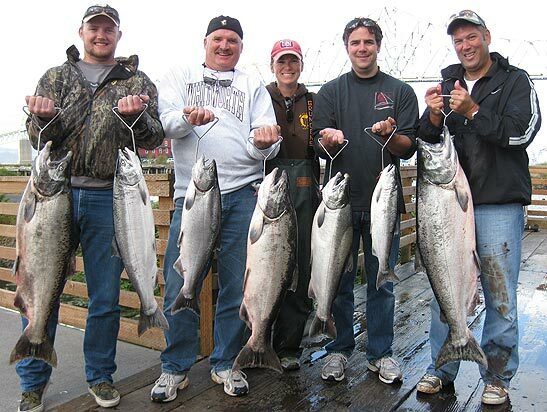 We provide high quality fishing trips at the median price for guides in the NW. We could charge more or we could charge less, but we don't want you to come fishing with us because your decision is based on price. We want you to come fishing with us because you think we run a first class operation, that we are going to treat you well, and because we catch fish. We're not the Dollar Store of fishing guides and we certainly aren't the Four Seasons. Our pricing is middle of the road. We believe in charging enough so that we can use high quality equipment, maintain this equipment, and not have to cut corners. We also believe that charging the average price will hopefully allow you to come back more often. We really take fishing seriously, it's our passion and we certainly want to catch fish just as much as you do; that's why we go during the best times to the best locations and spend extra time, effort, and money to make your trip the best that it can be. We want you to have a successful trip so you come back fishing with us, we also want to be successful so we maintain our reputation as top notch guides. We take a lot of pride in our fish catching ability and we do everything in our power to put fish in the box, while at the same time having fun, and keeping you safe. Our approach to life and to fishing isn't standard, and it would certainly be "easier" for us if we weren't worried about these things, but the easy route and the safe bet aren't what we're after. We care about you and we care about your experience on our boats. We believe our customers, peers and fellow fishermen know that we hold this philosophy close to our hearts and that they know we are out there every day living it. We believe it's important to not let them down. Kevin, Lacey, Chris & the whole Total Fisherman crew! Who is behind Total Fisherman? Kevin Newell & Lacey DeWeert are the Total Fisherman team! Total Fisherman Guide Service was founded in 2000 and we have enjoyed every minute since! We're looking forward to fishing with you!